Saturday, June 30, was a perfect Indiana summer day. Sunny, clear and dry. The cloudless sky was a deep blue and the streets were crowded with shoppers eager to conclude their business and get on with enjoying the weekend. Across the street from the bank, which was situated near the corner of Wayne and Michigan streets, was the State Theater. The featured film was "Stolen Sweets" starring Sally Blane and Charles Starrett. A huge banner with red lettering proudly advertised the theater's new cooling system "designed for the comfort of our customers." South Bend Officer Howard Wagner, 29, was directing traffic at the nearby intersection. He had been filling in for the vacationing officer who usually worked that corner. The regular officer was returning to duty the next day, and Wagner would be assigned to other duties. Betty Herbert, 22, an employee at a dry goods store down the street, waited at the corner for Wagner to stop traffic and allow pedestrians to cross. As she passed Wagner in the center of the street he smiled and nodded. She wondered if he was married. It was 11:30 a.m. and Wagner had less than 10 minutes to live. As Wagner and Herbert exchanged smiles, the assistant postmaster was making his way along the busy sidewalk to the bank to deposit the morning's receipts. They totaled $7,900, far less than what Van Meter had predicted. Sitting in a car nearby were two police detectives, Edward McCormick and his partner, Harry Henderson. They had been watching the postal employee walk to the nearby bank each day for several weeks after receiving a tip he was going to be robbed. As the employee safely entered the bank, the two detectives decided to drive to a lunch counter on the next block for cold pork chop sandwiches. Henderson had just remarked that he also planned to have a piece of apple pie. Maybe with ice cream on top, he chuckled. 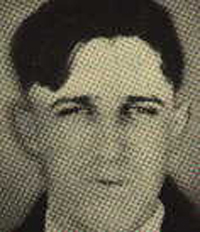 As the detectives were ordering their sandwiches and the postal employee was watching a teller count the federal receipts, Alex Slaby, a young bachelor who lived just outside of town, turned his late-model green Ford coupe right onto Wayne Street from Michigan Street, and pulled into a parking spot near the corner. The next five minutes would be the highlight of his otherwise routine life, and would give him a story that he would tell and retell over the years. Slaby was about to get out and begin his weekly shopping when a tan Hudson with dried mud on the passenger side door double-parked next to him. Four men got out. Slaby later told police that as two of the men crossed in front of his car he thought one of them looked familiar, but he wasn't sure how he knew him. Was it someone he had gone to school with? Once worked with? The one he half recognized, he said, was wearing overalls and a straw hat. He appeared to be wearing some sort of heavy coat or vest under his light blue shirt. Strange on such a warm day, thought Slaby. He then noticed the two were holding large rags or pieces of cloth and he saw the ends of gun barrels sticking out. He realized they were robbers and were about to hold up the bank just around the corner. Slaby started to panic. He saw the policeman on the corner directing traffic, but he couldn't call to him without alerting the robbers. He quickly scanned the busy street but saw no immediate help. Should he get out and run to the policeman? Should he start blowing his horn? "Get outta here." The voice startled Salby and his head snapped to his open window. One of the other two robbers who had started to walk behind Slaby's vehicle was leaning into the car. "Go ahead. Scram," he said quietly, pointing the barrel of his gun. The robber then walked quickly toward Michigan Street and the other three men. Slaby, a small man at 120 pounds and just over five feet, five inches, got out of his car. He noticed the Hudson's engine was running and the radio was playing a popular Broadway show tune. He knew he had to act fast. He started to reach across the passenger seat for the ignition keys, but just as he was about to grab them a voice asked, "What are you doing, friend?" 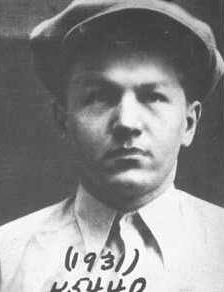 Slaby turned and was nearly at eye level with a short man wearing a light blue summer suit and a white cotton hat. He had a checkered tie and a boyish face. He was smiling slightly, said Slaby, but not with his eyes. "Nothing. Someone left his car running," said Slaby trying to act relaxed. "Maybe the guy wants it running," smiled the little man, his eyes never leaving Slaby. "Yeah. Maybe," said Slaby, pretending to have lost interest. With a quick wave, Slaby turned and began walking across the street in what he hoped looked like a causal stroll. He was going to call the police from the store directly across the street. Nelson watched him cross and then turned his attention to more pressing matters. His suit coat hid a machinegun. His assignment was to watch the car and deal with any citizens who might try to be heroes. The other three had just turned the corner and approached the bank. One of the robbers, later identified as Van Meter, stopped in front of a shoe store next to the bank. 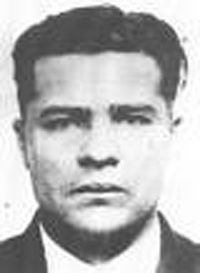 He had a .351 rifle under his jacket and his assignment was to guard the entrance to the bank. 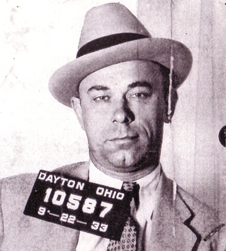 A fifth member of the gang, who had arrived in a separate vehicle, joined Dillinger and the other robber and the three entered the bank. "This is a holdup," one of them shouted, and two of the bandits went behind the counter and started grabbing the money. At one point, one of the robbers released a burst from his machine gun toward the ceiling. Near panic erupted and the customers, about 25, rushed to the back of the bank. One of the bandits, a cigar in his mouth, smiled at Delos M. Coen, the head cashier, who had been standing at his desk talking with Perry G.Stahly, a prominent South Bend businessman and a director at the bank, when the robbers arrived. Both men later identified the bandit as Floyd. Outside, pedestrians took little notice of the firing from inside the bank. Some later said they thought it was an early Fourth of July celebration; others hearing the noise and seeing Van Meter, dressed in baggy overalls and a straw hat and pacing rapidly back and forth, assumed it was some sort of bank promotion. Officer Wagner, however, figured he had better look into the matter. Van Meter saw Wagner cross the trolley tracks and start toward the bank, his traffic whistle still in his mouth. Before he had gotten much closer, however, Van Meter raised his rifle and fired. Witnesses said Wagner was knocked back by the force of the bullet but remained standing for a moment looking toward the bank. A look of surprise on his face. He then began to stagger back toward the intersection. He had only moved a few steps before he fell to the pavement near the tracks. He was dead. For a moment the street froze in time. There was no movement; no sound. A second later the street exploded with shouts and screams as pedestrians scrambled for safety, and vehicles slammed on brakes to avoid people and other cars. The sound of approaching sirens could be heard. Inside the bank things weren't much better. Some customers were crying, others were shouting at the robbers. Harry Berg, whose jewelry shop was several doors down on Michigan Street, grabbed a small handgun he kept in the shop for protection and ran out his door. He saw Nelson and opened fire. One bullet hit a nearby car; another went through the window of a store across the street; yet another hit Nelson in the back, but because Nelson was wearing a bulletproof vest, he simply staggered for a moment. Nelson then spun around and opened fire. One of the bloodiest chapters in South Bend's history was about to unfold.